↑ 1.0 1.1 Black, Ian (19 October 2018). "Jamal Khashoggi obituary". The Guardian. https://www.theguardian.com/world/2018/oct/19/jamal-khashoggi-obituary। আহৰণ কৰা হৈছে: 25 October 2018. ↑ Hubbard, Ben; Gladstone, Rick; Landler, Mark (16 October 2018). "Trump Jumps to the Defense of Saudi Arabia in Khashoggi Case". The New York Times. https://www.nytimes.com/2018/10/16/world/middleeast/pompeo-saudi-arabia-turkey.html. ""Mr. Khashoggi, who wrote columns for The Washington Post, lived in the United States, and his 60th birthday was on Saturday [October 13]."" ↑ "Khashoggi 'died after fight' – Saudis". BBC. 19 October 2018. https://www.bbc.com/news/world-middle-east-45923217. ↑ "What we know (and don't) about missing Saudi journalist Jamal Khashoggi". https://eu.usatoday.com/story/news/world/2018/10/11/saudi-arabia-journalist-jamal-khashoggi-disappearance-what-we-know/1598590002/। আহৰণ কৰা হৈছে: 16 October 2018. ↑ "Speakers". International Public Relations Association – Gulf Chapter (IPRA-GC). 2012. http://www.prwcdubai.com/english/speaker_article.php?idsp=11। আহৰণ কৰা হৈছে: 10 May 2012. ↑ "Who is Jamal Khashoggi?". Al Jazeera. https://www.aljazeera.com/news/2018/10/profile-jamal-khashoggi-saudi-writer-missing-turkey-181007184026645.html। আহৰণ কৰা হৈছে: 15 October 2018. ↑ "Who Is Jamal Khashoggi? A Saudi Insider Who Became an Exiled Critic". Bloomberg. 10 October 2018. https://www.bloomberg.com/news/articles/2018-10-10/jamal-khashoggi-s-shift-from-insider-to-exiled-critic-quicktake. ↑ Philippe Martinat (10 October 2018). "Disparition du journaliste saoudien Jamal Khashoggi, le mystère demeure" (french ভাষাত). 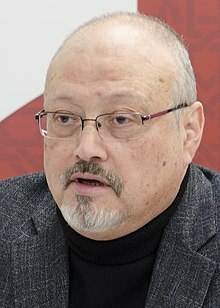 http://www.leparisien.fr/international/disparition-du-journaliste-saoudien-jamal-khashoggi-le-mystere-demeure-10-10-2018-7915158.php. ↑ "Jamal Khashoggi". World Economic Forum. https://www.weforum.org/people/jamal-khashoggi। আহৰণ কৰা হৈছে: 21 July 2012. ↑ "Opinion – Saudi Arabia wasn't always this repressive. Now it's unbearable.". https://www.washingtonpost.com/news/global-opinions/wp/2017/09/18/saudi-arabia-wasnt-always-this-repressive-now-its-unbearable/। আহৰণ কৰা হৈছে: 7 October 2018. ↑ "Saudi journalist Jamal Khashoggi tells BBC: 'The Oslo Accords are dead'". The Washington Post. 11 September 2018. https://www.washingtonpost.com/news/global-opinions/wp/2018/09/11/saudi-arabias-crown-prince-must-restore-dignity-to-his-country-by-ending-yemens-cruel-war/?utm_term=.6e2a41a007d5. ↑ "‘Tell Your Boss’: Recording Is Seen to Link Saudi Crown Prince More Strongly to Khashoggi Killing". https://www.nytimes.com/2018/11/12/world/middleeast/jamal-khashoggi-killing-saudi-arabia.html. ↑ Coskun, Orhan. "Exclusive: Turkish police believe Saudi journalist Khashoggi was killed in consulate – sources". Reuters. https://www.reuters.com/article/us-saudi-politics-dissident/exclusive-turkish-police-believe-saudi-journalist-khashoggi-was-killed-in-consulate-sources-idUSKCN1MG0HU?il=0&utm_source=reddit.com. ↑ "Turkey to search Saudi Consulate for missing journalist". The Washington Post. 9 October 2018. https://www.washingtonpost.com/world/europe/post-publishes-possibly-last-image-of-missing-saudi-reporter/2018/10/09/e2e8acae-cb82-11e8-ad0a-0e01efba3cc1_story.html?utm_term=.285330495dfc। আহৰণ কৰা হৈছে: 13 October 2018. ↑ "Turkish prosecutors 'find evidence of Jamal Khashoggi killing'". Al Jazeera. 15 October 2018. https://www.aljazeera.com/news/2018/10/turkish-prosecutors-find-evidence-jamal-khashoggi-killing-181015205254636.html। আহৰণ কৰা হৈছে: 17 October 2018. ↑ Umut Uras (31 October 2018). "Turkey: Khashoggi strangled immediately after entering consulate". Al Jazeera. https://www.aljazeera.com/news/2018/10/khashoggi-choked-death-dismembered-turkey-prosecutor-181031145816813.html. ↑ Prengel, Kate (12 October 2018). "Hatice Cengiz, Jamal Khashoggi's Fiancee: 5 Fast Facts You Need to Know". https://heavy.com/news/2018/10/hatice-cengiz-jamal-khashoggis-fiancee/। আহৰণ কৰা হৈছে: 20 October 2018.